The Crawford Fund family is saddened to report the passing of our board member and inaugural Tasmanian chairman, Mr Ian McLean MacKinnon AM on March 11, 2016, as the result of a farm accident. Ian had farmed in the Tasmanian Midlands for over four decades, as well as having as many years in agro politics and research and development as a former Chair of the Grains Research and Development Corporation’s Southern Panel and then with the Crawford Fund. His service was recognised this year with an AM. As a leading grain and livestock producer, he has always been an example to others and has been involved in many important roles in farmer and community groups. For example, he was one of the instigators of Southern Farming Systems in Tasmania and Victoria, a very progressive group introducing and testing improved farming practices like raised beds, direct drilling and improved crop and livestock rotations. Ian was a farmer with a good understanding and appreciation of the science behind research and development, so lent his considerable support to improvement of agriculture through science and was an obvious choice as chair when the Fund first set up a committee in Tasmania. 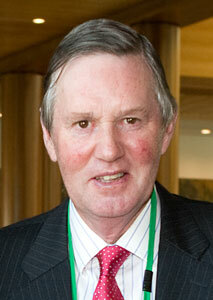 The Board noted with sadness the death of Ian MacKinnon AM, a member of the Board since 2010. Ian was the foundation chair of the Fund’s Tasmanian Committee. Just a few weeks before his untimely death, Ian was actively pursuing the Fund’s objective of enhancing Australia’s engagement with international agricultural research—to the benefit of Australia and developing countries. He was well-known and respected in Tasmania, Australia and internationally. Many people who knew Ian well remember his worth and all the good times in which his company, friendship and work was such a valued contribution to Tasmanian, Australian and global agriculture.